Enriched with Bilberry fruit and carotenoids, this proprietary formula was designed to help protect every fiber and nerve of the eye. 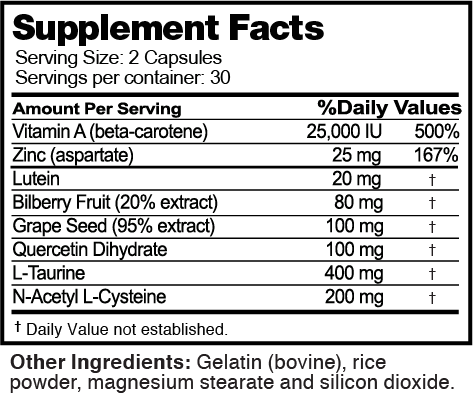 Suggested Use: Take 2 capsules daily with food or as directed by a health care professional. Lutein: Blocks blue light from reaching the underlying structures in the retina, thereby reducing the risk of light-induced oxidative damage that could lead to macular degeneration (AMD). Bilberry fruit: Bilberry is often touted as a remedy for eye conditions such as glaucoma, cataracts, dry eyes, age-related macular degeneration, and retinitis pigmentosa*.